Plantation Rum. The name sounds innocuous, but the way these rums are made are unlike any others you’re likely to encounter. 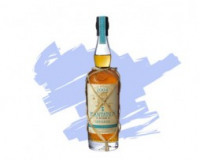 Cognac Ferrand has long a history of providing Cognac Casks to various Caribbean rum producers based upon the rum producer’s need for quality oak casks to age their rum. Because of this long history Cognac Ferrand has over time developed solid relationships with many of these producers. Based upon these relationships they have been able to acquire certain unique batches of rum from various Caribbean sources. Typically these rums are brought back to France to be finished in their own warehouses and of course in their own Cognac Casks. The rums are produced by the team behind Pierre Ferrand cognac and Citadelle Gin, single-country in origin with a bit of a twist. The rums are distilled in the country in which the sugar cane is grown, then put into either old bourbon or sherry oak casks, then aged in country. After several years of aging, the casks are then shipped to France and aged a second time in French oak barrels, after which they are then bottled for sale. Plantation comprises nine different rums and produces a different “vintage” each year (with a couple of special, non-vintage editions in the mix).